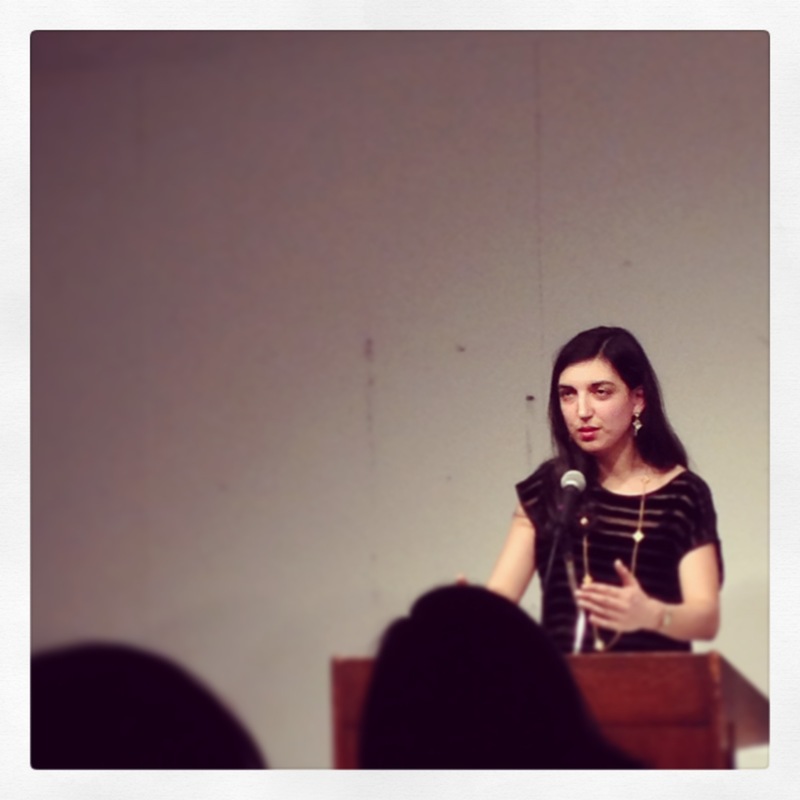 Elif Batuman, dropping some knowledge bombs at the Creative Writing Lecture at Columbia on Wednesday, February 5, 2014. First, a confession: I never finished reading Elif Batuman’s essay collection, The Possessed: Adventures With Russian Books and the People Who Read Them. The book came out my senior year of undergrad, when I was already drowning in Russian literature as a Russian language and literature major. I started it, I chuckled, I thought this is a book to which I am definitely going to relate, and then put it down. It felt sort of like reading about a war while you’re already in the trenches fighting one. However, after hearing Elif Batuman speak the other night at the Columbia Graduate Writing Program’s Creative Writing Lecture, The Possessed is next on my list of books to read in post-grad-school life. Don’t feel bad about writing stupid stuff. Everyone does it and if you try not to write anything dumb you will get stuck and just won’t write at all. Enjoy throwing away whole chunks of your writing as you edit. Even the things you cut out are not lost – it is all part of your process and may show up in another piece, at a different time. Print out your work to edit and reorder, because it makes it feel more real than just the mush of stuff going on in a Word document on your computer. Don’t compare yourself to others. “Describing the human experience is a job too big for one person,” Batuman said. There can’t just be one writer, because writers think about and work with problems, and luckily no one person has had all of the world’s problems. “Think of everyone as your peer, not your competition,” Batuman said. Don’t listen to readers and editors you don’t trust, but do listen to the readers and editors that you do trust. Fight your instinct to be defensive when someone criticizes you. Take a lot of pictures with your phone. It will help you remember things better when you’re writing about them later. When people say funny or insane things, write them down right away. Careful of what you read right before you write – it can influence your style and voice. Writing about how you think you’re going to die is boring. “You’re not going to die. Probably not. At least not now. Everyone thinks that at first. Get it out and move on,” Batuman said. Don’t be embarrassed to tell people you’re a writer. It’s just another job, like being a banker or a plumber or a teacher. It’s better to try to write for four, one-hour periods than one, four-hour block of insanity. When you go on vacation, let yourself have an hour each day to write. You’ll be nicer to the people you’re on vacation with. Don’t force yourself to go outside and play Frisbee all the time, like Batuman did. Your brain is an organ. Take care of your muscles, exercise, “and don’t do too many drugs,” Batuman added. Especially when writing nonfiction, you need to be aware of how you perceive yourself versus how you perceive others. Batuman compared it to when she shops for clothes and always thinks about how the items look on the hanger, but doesn’t consider how they will look on her own body. She also mentioned a friend who had been buying his shoes a size big his whole life: “I thought that was just how shoes fit,” he said. It’s impossible not to offend anyone. “Lots of things you learn from the bitter, biter experience of offending people,” Batuman said. “Don’t be upset when a life experience doesn’t fit into a genre,” added Batuman. She pointed out that the affect of an experience isn’t necessarily the same as the affect of the writing about it: an awful experience can become funny, while a great experience can become sad or scary. “If you have a problem in your writing, one way around it is to describe it as best and honestly as you can,” advised Batuman. Don’t talk too much when you’re interviewing people. It’s impossible to write the same exact thing as someone else. Don’t be upset if you find that a book already exists out there with your idea. Everyone writes about things differently and comes from his or her own experiences. Get Real: Who’s Lookin’ at Whom?